Yangshuo nestles along the Li River in Guangxi Province amongst karst hills sculpted for millennia by wind and rain. Han Yu, a poet who lived during the Tang Dynasty (618-907), said the Li River was like a green silk ribbon and the karst hills were like jade hairpins. Everything in Yangshuo is in walking or bicycling distance, but taxis and electric buses are on hand when you’re ready to get off your feet. 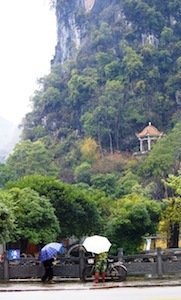 There is no airport in Yangshuo, but visitors fly into Guilin to the northeast and take a bus or taxi to Yangshuo. Guilin is a three-hour flight southeast of Beijing near the Vietnam border. 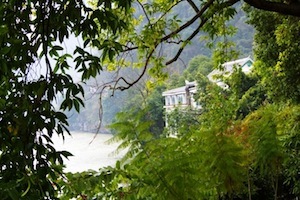 It rained almost the entire two weeks in January that I was in Yangshuo. The locals said this was unusual weather for this time of year. The rain, however, made for a dreamy atmosphere, with wisps of fog softening the edges of all that could be seen. The rain did little to discourage sightseers who braved the elements to bask in the glorious scenery. For glorious scenery, a trip to 3,000-foot Longshen Mountain and the Dragon Backbone Rice Terrace Fields is a three-hour bus ride from Yangshuo. Work on the terraced fields began during the Yuan Dynasty (1279-1368) and ended during the Qing Dynasty (1644-1911). The fields are called Dragon Backbone because the terraces look like the scales on a dragon’s back and tail. The top of the mountain was socked in, with limited visibility the day of my trip. The limited visibility, however, did not dampen the adventurous climb up and down hundreds of stone steps with no handrails and a sharp drop off one or both sides of the stairway. It’s not a climb for the fainthearted. 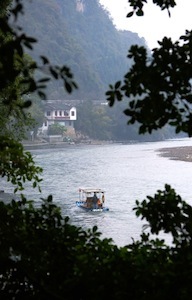 After the fog on Longshen, rafting on the Li River back in Yangshuo was refreshing. The river was smooth, the air crisp, and the views spectacular. The rafts were traditionally made of bamboo and propelled with oars or long poles. These days, they are made of PVC with a little outboard engine tacked on the rear. During summer months, larger vessels for every budget and taste cruise the river, but in the winter months only the smaller vessels traverse out on the water. This means greater opportunity, with fewer distractions, for the eye to linger on the majesty of the great hills and for the heart to fill with the mildness of the graceful river. It was a glorious cruise. It was nevertheless satisfying to get back to shore for a walk along tourist-oriented West Street. Glancing down a bicycle-lined alley, I saw a woman carrying crisp, green, leafy vegetables for sale in the centuries-old tradition of a pole slung over the shoulders with two baskets strung from each end. The bicycles are a more modern means of conveyance, but still echo leisurely-paced charm. You can find rentals everywhere and there are bike tours along the river to nearby villages. Food tends to be spicy. The popular local dish is beer fish, a one-dish meal of Li River carp and nine different vegetables and spices. Western food is served and, for those who must have their fast food Western-style, McDonald’s and KFC are near West Street. The karst hills and Li River are majestic and serene. There are many English-speaking folks here, getting around is easy, and costs are nominal. It’s a popular tourist destination, so two- and three-day tours from major metro areas like Beijing or Shanghai are easy to arrange and a very affordable way to get away to Yangshuo, a picturesque corner of China. If you’d like to purchase this article for your publication, click here to contact the author directly.